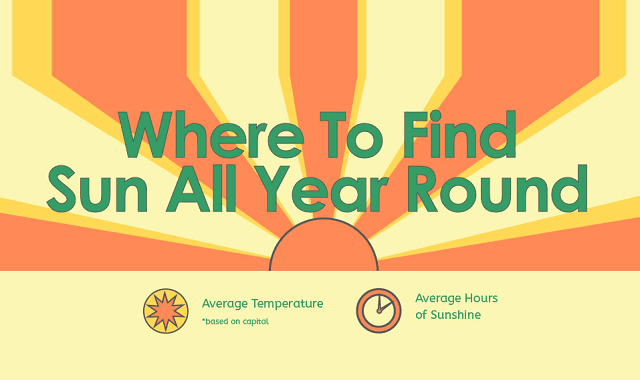 Where to Find Sun All Year Round #Infographic ~ Visualistan '+g+"
When it’s as dreary as it is outside many of us long for some more sunshine and those warm summer rays. Sometimes we’ll look through old photos of holidays and remember what it’s like to feel that summer warmth. However, what if we told you that you don’t need to just dream about it, but you could actually go somewhere right now to get some sun? The Solar Centre’s latest infographic tells you where you can go around the world to be able to experience that sunnier weather, all year round. You also don’t always have to travel that far, with Malta being a prime example of where they see good weather for 300 days a year. There are a variety of countries all over the world that you can visit to escape the bitter, winter cold. Take a look at our infographic below and decide where you’d most like to go and visit.